All of the campgrounds are very well marked and the sites have shelters and or tent pads. Shelters are typically available at campgrounds on Lake Superior, but not all of the them. The tent pads are usually very well defined except in campgrounds that do not get a lot of use. Sites / Site Types: The number of sites and the type of sites available at the campground, are based on the National Park Service “Greenstone” newspaper and my last visit to the campground. Fires: A listing of whether or not fires are allowed, are based on the National Park Service “Greenstone” newspaper and my last visit to the campground. If listed as “Y”, there are fire rings at each site. Listed as “S”, means there are Standing Grills at each site. 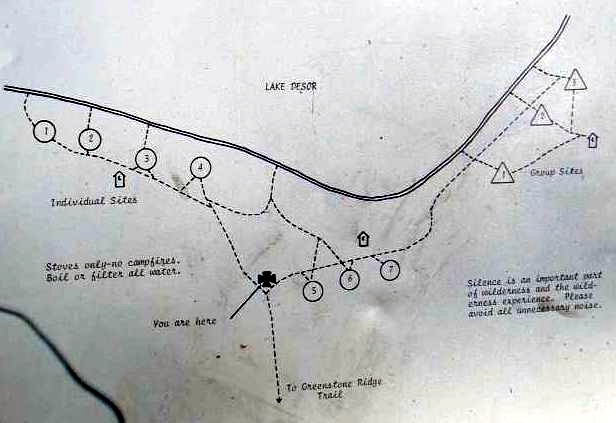 Listed as “C”, indicates there is a Community Ring” there, which is a ring centrally located for a fire. 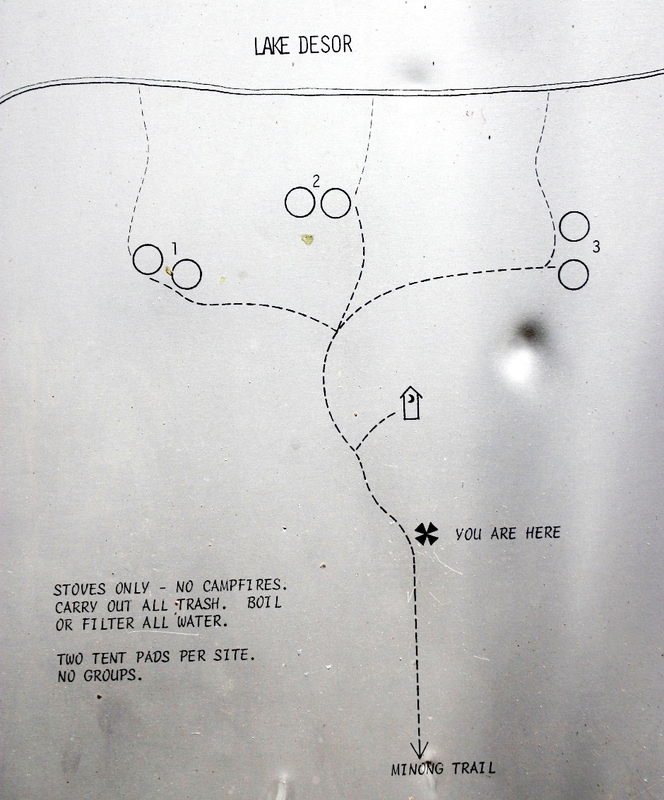 If both “S” and “C” are listed, there are typically standing grills at the individual sites and a ring at the group sites. Tables: Lists whether or not there are picnic tables at the campground. They are generally available at sites that have a dock on Lake Superior, but not always. TP: Some outhouses have extra pegs for storage of TP in them and these are usually stocked. The ones without the pegs typically do not have any in them. Typically, the stocked ones are the campgrounds on Lake Superior with docks. I typically go during the “off” season, so during the busy season, this may be different. There is no guarantee at any campground. Generators (Gen): Some water campgrounds allow boaters to use generators while docked. This indicates whether they can be used or not. Dock: If there is a dock, the depth in feet is listed according to the National Park Service “The Greenstone” paper. Wilderness (Wild): This is my rating for wilderness feel. 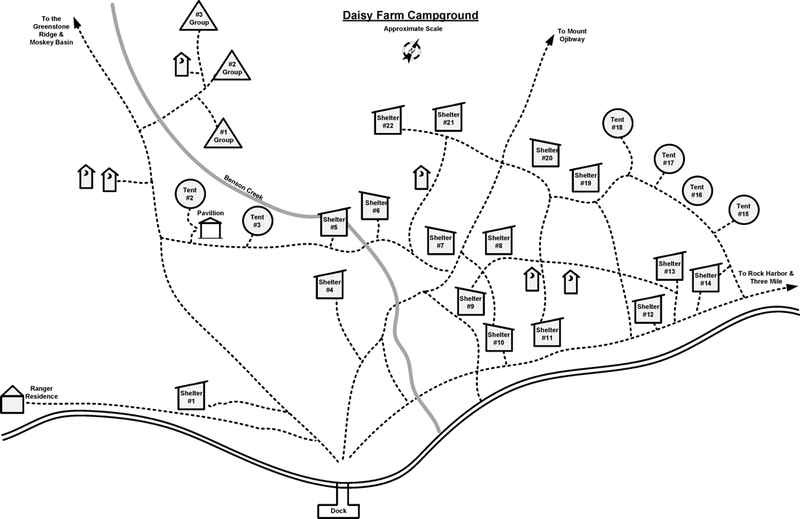 Campgrounds vary in how isolated they feel based on how close you are to drop-off points and general park operations. 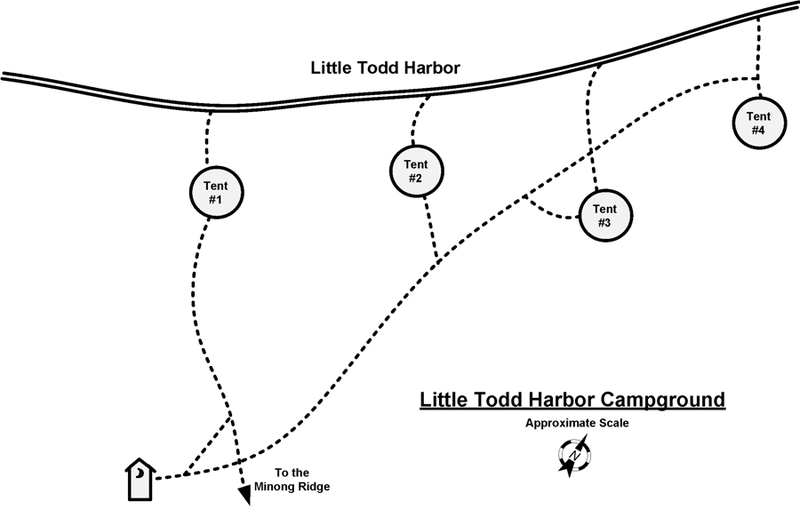 For instance, Three Mile Campground is close to Rock Harbor and between there and Mott Island (Park Headquarters), so there is a lot of activity around and through the campground, whereas other campgrounds are not close to any major drop-off point and not on a main trail (i.e. not easy to get to). 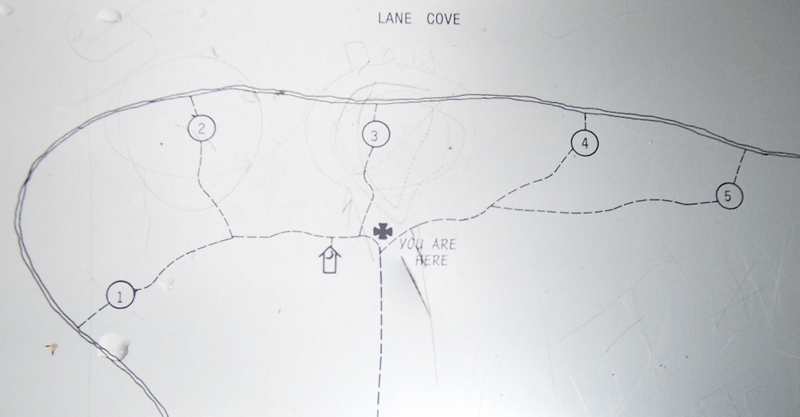 If the campground had maps, I have shown a picture of it. 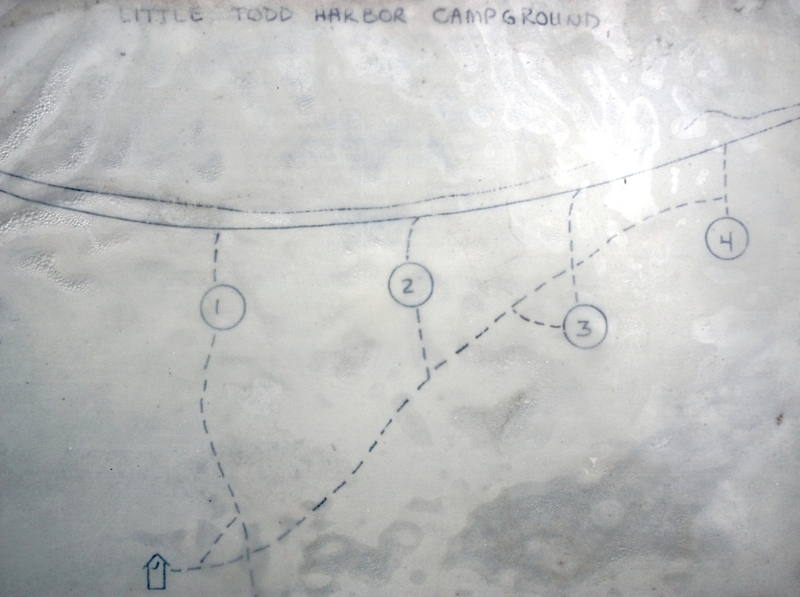 I have shown a drawing from my book of all of the campgrounds based on my visits to the campground and also a general description from my book. 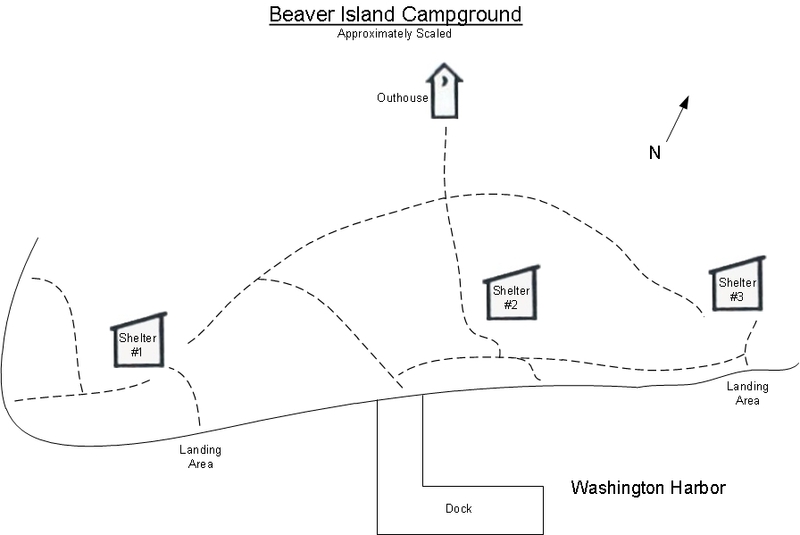 The Campground is located on the southwest corner of Beaver Island, in Washington Harbor. It is a nice campground, but it attracts many boaters and you may hear generators running at the dock here, plus the sounds of Windigo. Walking to the west point of the island, past Shelter #1, there are rocks along the shore that make for a great place to sit and offers views up and down the harbor and north of the island. 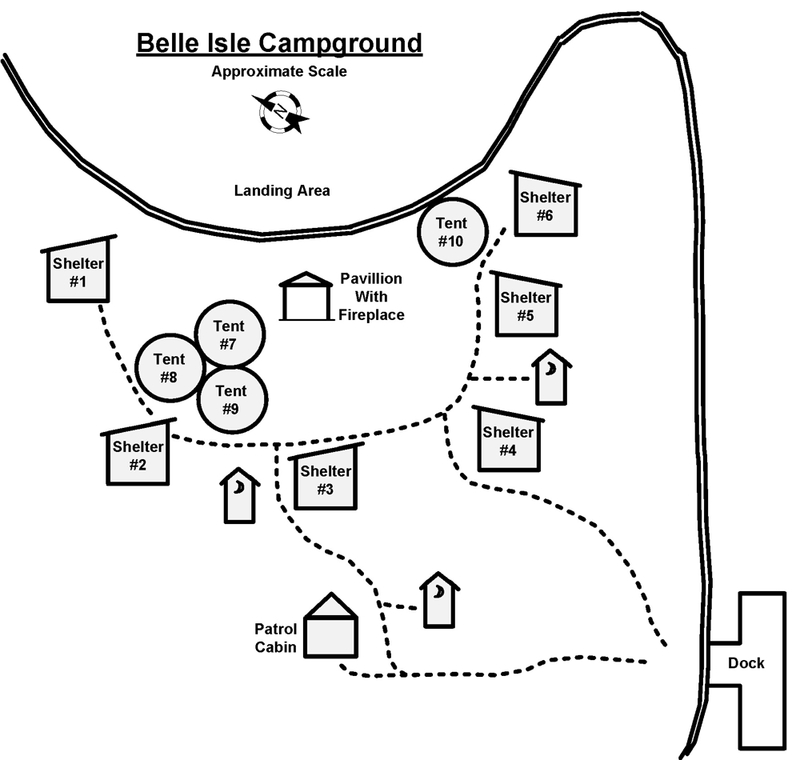 The Campground is located on the east side of Belle Isle Island, which is on the northeast side of the main island, on the south side of Amygdaloid Channel. The Voyageur will stop here when doing its north side trip, if scheduled. This campground is popular with boaters, and generators are allowed at the dock, but the dock is about 500 feet away from the nearest shelter, so it is far enough away where you should not hear them. This campground truly lives up to its name “beautiful island”, it is a lovely place to stay and makes for a nice trip with canoes or kayaks to go from here to other places nearby. There is a “Patrol Cabin” at the campground that is occupied by a “campground host” and sometimes rangers during the peak season. The fact that there is a campground host and it is popular with boaters, takes away from the wilderness aspect of it. However, in the early and late season it would have a higher wilderness rating. I had the pleasure of spending three whole days there in early May without seeing another soul. By the dock, there is a clearing with a picnic table and standing grill for use if docked. 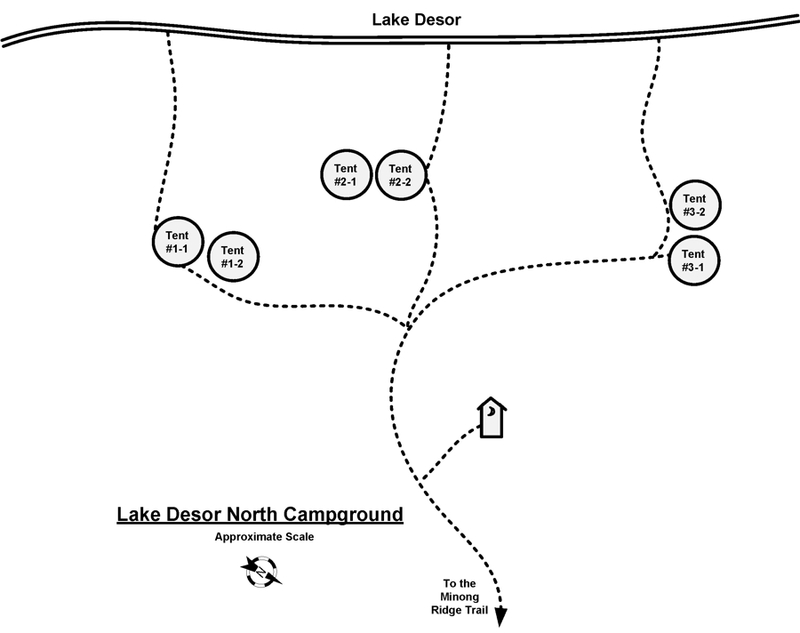 This campground seems very similar to Daisy farm in that it is situated on the water with the meadow and well-worn trails cut in it. There is pavilion in the center of the meadow between the shelters to the far east right near the bay, with picnic tables, a fireplace with a cook stove and all kinds of things people have found and piled up on the mantel. 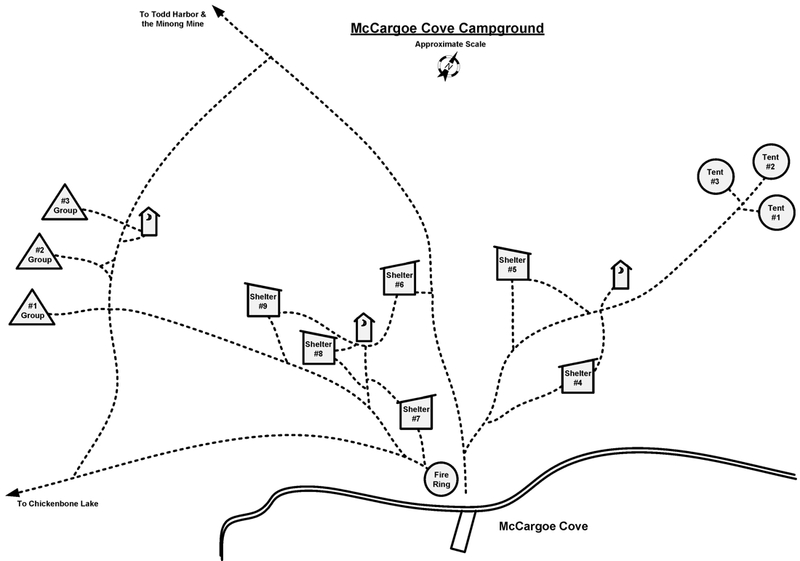 The Campground is located on a small island, just inside the entrance to McCargoe Cove. The first half of the name, “Birch“ is no longer true as most of the Birch is gone and the remainder is dying for the most part. It is a very quiet campground, except when the Voyageur passes by every other day or less, and when boats come in and out of the cove. Boaters will sometimes use it, but with a depth of 5’ or less, it cannot be a big boat and generators are not allowed. It is a beautiful campground to spend an afternoon, but I do not think I would want to spend a lot of time there as you are limited on things to do. The last time I was there, there was a picnic table just behind the dock in addition to the tables at the shelter and tent pad. 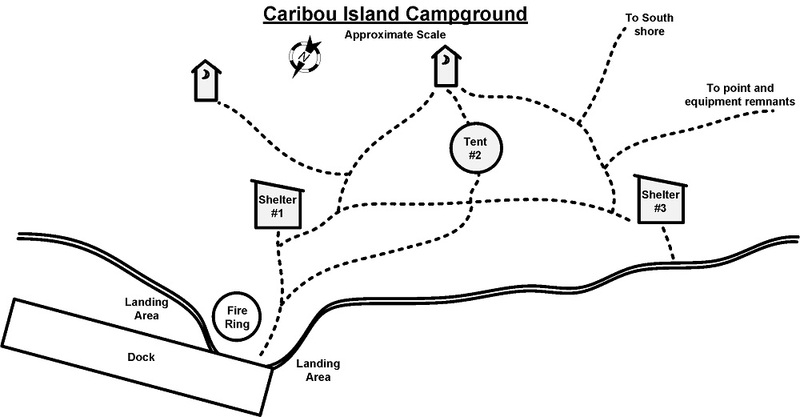 The Campground is located on the south side of Rock Harbor, southeast of Daisy Farm Campground, and next to Middle Islands Passage on West Caribou Island. This is a very nice campground that is centrally located close to many things. During the summer, it is very popular with the boaters due to its location, and I know the Isle Royale Queen docks here later in the year, when it overnights. The dock is quite big, so a few boats could potentially tie up there. Generators are allowed at the dock, which is very close to the sites. The last time I was there, in 2013, there was a picnic table on the dock in addition to the tables at the shelters and tent site. There is a community fire ring right by the dock that, the last time I was there, had very nice seating around it. The Campground is 0.09 miles north from the Greenstone Ridge Trail and is a very easy walk. The trail leaves the post and crosses some boards, then climbs a steep 3-4 step ridge, and seems to come to the campground out of nowhere. The first time I came to the campground in 1999, I wrote “This is the only campground I have stayed in on the island that I did not think was beautiful. It lies on a hill above the lake, in an open area, with small scrub forest and a few trees. There are no real vistas to be seen, except, maybe in the spring, you can see the lake”. There still aren’t vistas and the water is still a long ways away, but the campground has grown up and the sites have become somewhat private. I sort of like it now. It doesn’t have a view of the lake, except in the spring. The water source (lake) is 0.25 miles, down a hill that descends 135’ over the distance, which, can be very slippery in the rain. 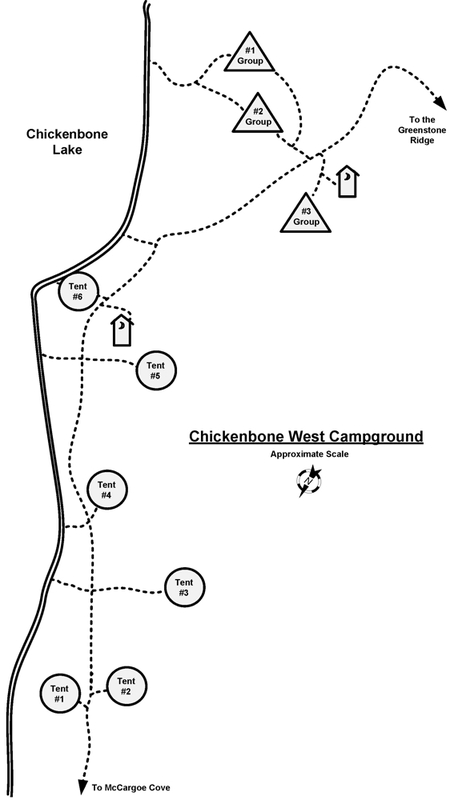 This campground is a good alternative to Chickenbone West during the busy season, or if you just want to avoid people. 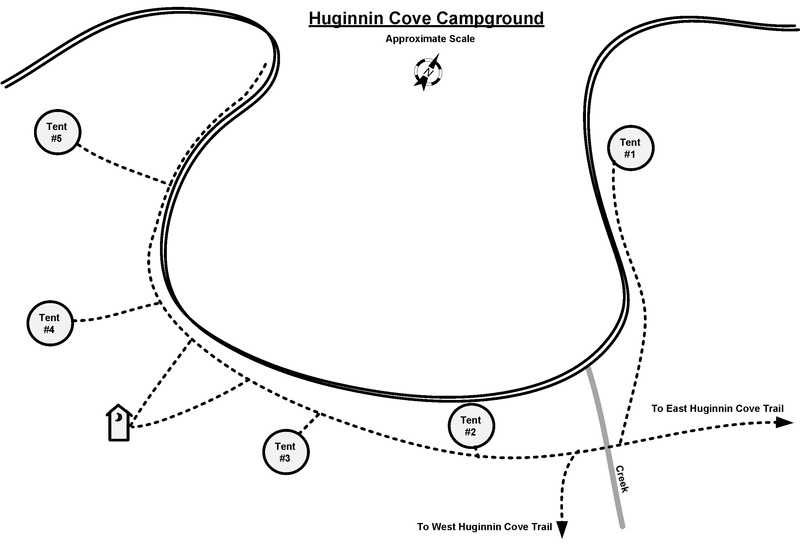 The Campground is 0.11 miles north of the Greenstone Ridge Trail, and 2.5 miles, from McCargoe Cove Campground, along the Indian Portage Trail. It is very nicely located right on the lake, with excellent views. It is also a good area for moose watching. This campground can get a lot of people in the busy season, and seems to be on a lot of itineraries for big groups (i.e. boy scouts, kid camps, etc.). From the north to south campground sign, it is 0.18 miles from end to end. The Campground is situated on a very calm and protected harbor quite a ways from Lake Superior. The harbor has very nice views ranging from cliff and rock, to lowland areas. The campground has a dock and is frequented by boaters and fishermen quite a bit. However, generators are not allowed, so it is quiet. The Voyageur will stop here on its southern route if reservations are made. The Campground is located along the shore of Rock Harbor, across from the Edison Fishery. This is one huge campground. For as big as it is, there really aren’t any bad sites, except the tents sites. I have always tried to avoid it due to its size. However, the first time I did stay there, on September 29, 2001, there wasn’t anyone else in the entire place! The second time I stayed there, in May, 2002, it was empty again for two nights! It is a very nice campground, with a nice view of Rock Harbor and the Edison Fishery. The campground is very pretty, with an open meadow in the center area, with well-worn trails running throughout. Benson Creek runs through the campground, and there are four bridges crossing over it in the campground proper. The campground is a hub of activity during the day, due to its location with boats coming in and out, and people coming in or passing through. There are quite a few man made things you will see around the campground area. There is a ranger station down a short trail, just west of the campground. This campground also has a relatively large pavilion, which is very nice when it is raining. One of the two west outhouses and Shelter #1 is handicap accessible. I would imagine, you could reserve that shelter through the Park Service and get dropped off at the dock. 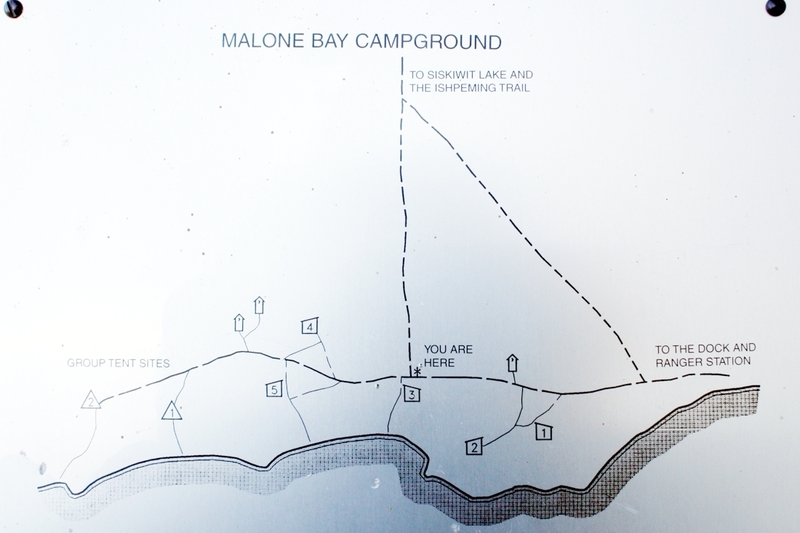 The Campground lies on a peninsula at the west end of Duncan Bay. All of the sites are very nice in this campground. During the busy season, I am sure boaters are most likely here, but if the tent spot is available, you would still have privacy and it would make it a good spot to come. There are standing grills at each spot and one grill and a picnic table by the dock. The Campground sits right on Duncan Bay, and lies basically below a cliff, that is Lookout Louise. It is a very nice place to spend a day. Once here, there is not a whole lot to do unless you are fishing in the lake. The Campground is situated right along the shore of Feldtmann Lake, which can be seen from any site, and faces northwest. 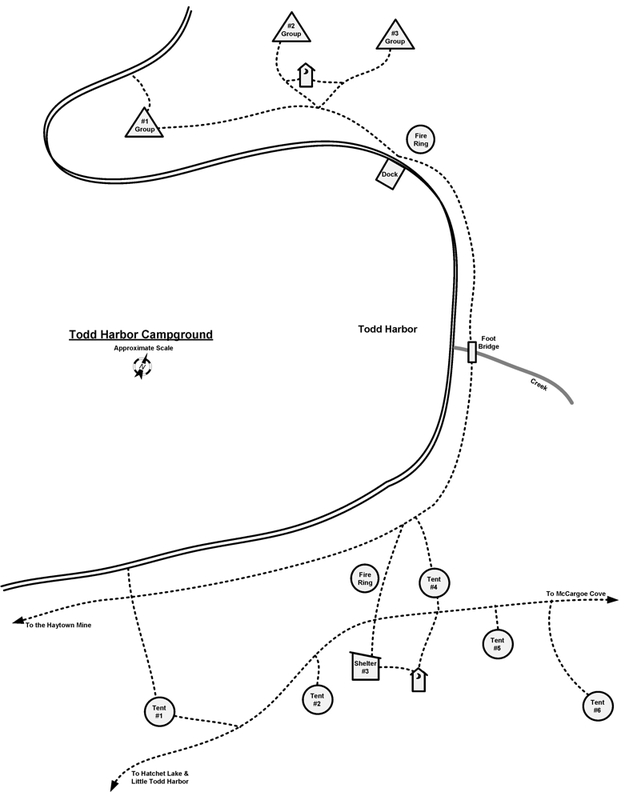 The total mileage for the loop, from the east post, to the west post, through the campground, is 0.12 miles and 0.13 miles, bypassing the campground. Feldtmann Lake campground is noted for its good moose viewing. When looking across the lake, it also gives you a great view of the Feldtmann Ridge that you will be hiking or have hiked. Looking across the lake, you will see the Greenstone Ridge, with Sugar Mountain being the prominent feature. Looking to the right, you will see the Feldtmann Ridge. The group sites and individual sites are all relatively close to the lake. 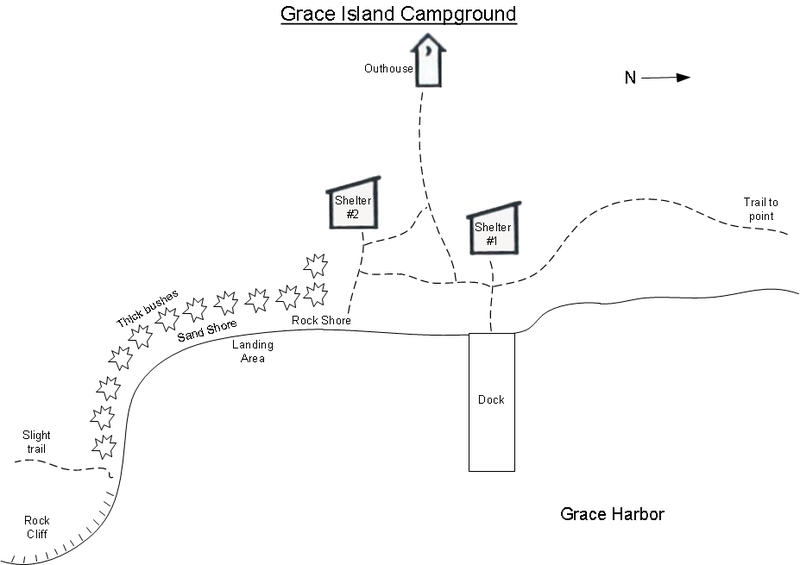 The Campground is on Grace Island which is located just south of the entrance to Washington Harbor, and just east of Washington Island. The campground itself is on the east end of the island facing south towards Grace Harbor. This is a popular campground with boaters due to its location and because it allows generator use, especially on the weekends when they will come over to fish on Friday and head back home Sunday. The northeast end of the island is a point, with a sand bar and rock beach, and offers a nice view towards Lake Superior with Barnum Island and Rock of Ages Lighthouse. It is also a great place to view sunsets. The foliage is very thick around the shelters and it is hard to get around besides on the trails. There is a point west of the dock, with a rock bluff that provides protection from the lake for the dock and landing area. Other than going to the point, there is not a lot to do at the campground proper. The Main feature of the campground is its central location to other things. All in all it is a nice place to spend a day, but not any longer unless using it is a home base to other areas. The Campground is 0.18 (GPS) / 0.2 (map) miles west of the Hatchet Lake Trail. After leaving the post, the trail goes west along the south shoreline, no more than 50’ away from the water. The trail has roots, rocks, wet areas and overgrowth until reaching the campground, which is about two thirds down the lake. There is no more than 20’ change in elevation for the distance. The campground is a definite man-made “niche” cut into some hilly terrain. Everything is on an incline towards the lake except where the tent pads are dug out. Hatchet Lake is a small lake, so it stays relatively calm. It is a quiet and serene area. Moose are a good possibility here. 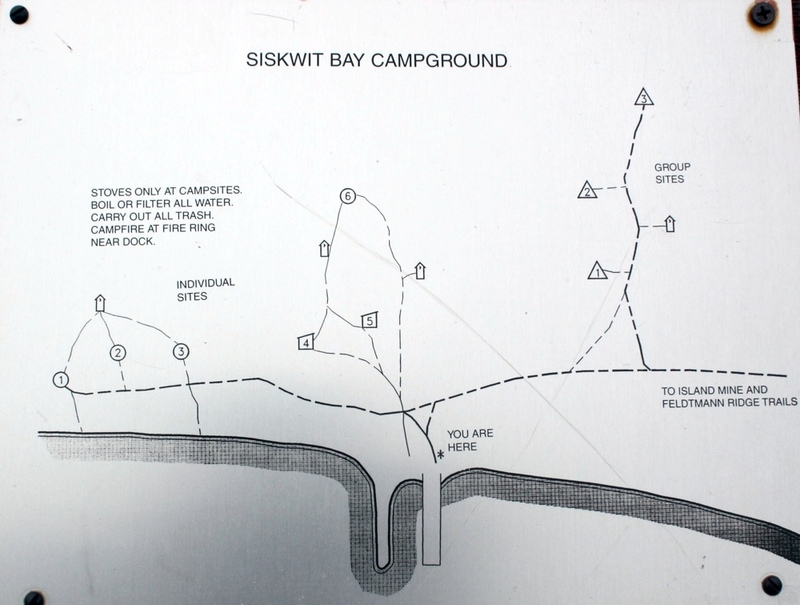 The Campground is located on the north side of Siskiwit Bay, in a narrow yet long very protected bay. It can be very peaceful, unless there is a boat there running a generator. It is popular with boaters due to its location and the good fishing in the area. However, it is not easy to get to and can offer a great wilderness experience. The “official” tent site is located about 150’ from the dock so, if boaters are at the dock, there is still some privacy. I say “official” tent site because there are at least two spots near the dock that look like they have been used as tent pads. There is a picnic table at the dock. The Campground is located on the north shore, along Lake Superior. It is a great place to view sunsets. Being on the north shore, if the lake is churning, there can be some wild wave action. This is one of my favorite campgrounds, for its views and serenity. Note: This campground was closed in Spring, 2011 for “improvements” and reopened in the summer. I have not been there since so, it will be different. The Campground is located on the east side of Intermediate Lake, which is located in between Siskiwit Lake and Lake Richie. It is only accessible by canoe or kayak, so you have to work to get there. The campground is very peaceful on a serene inland lake. It is kind of thick in the immediate area of the first two sites, but does get some sun in the clearing. It can be “buggy” depending on the time of year. There is not a whole lot to do there, but it is a nice place to spend a night. There is a trail that seems to go nowhere east of site #1 and I believe it runs to the portage between Intermediate and Richie lakes as there is another trail heading towards the campground at the portage. The Campground is in a small valley just before reaching the Greenstone Ridge Trail. This is the only campground on the island that is not located on a shoreline. It is in a relatively dense area of trees that can make it seem dark in the summer or fall, and block views of any distance. In the springtime, before the trees have filled, it offers some very nice views and seems quite open. It is a very pleasant place to stay the night and have a fire. It is one of my favorite campgrounds in the fall as the colors are spectacular. There is water available at a stream (the beginnings of the Little Siskiwit River), about 50’ from the campground. Based on my experiences, it seems to be a reliable source of water. Even in the late fall, it is flowing pretty well. However, I was told that in late August, 2002, the stream ran dry for a bit, but I have never heard of it going dry before, so I would rely on it (and have). 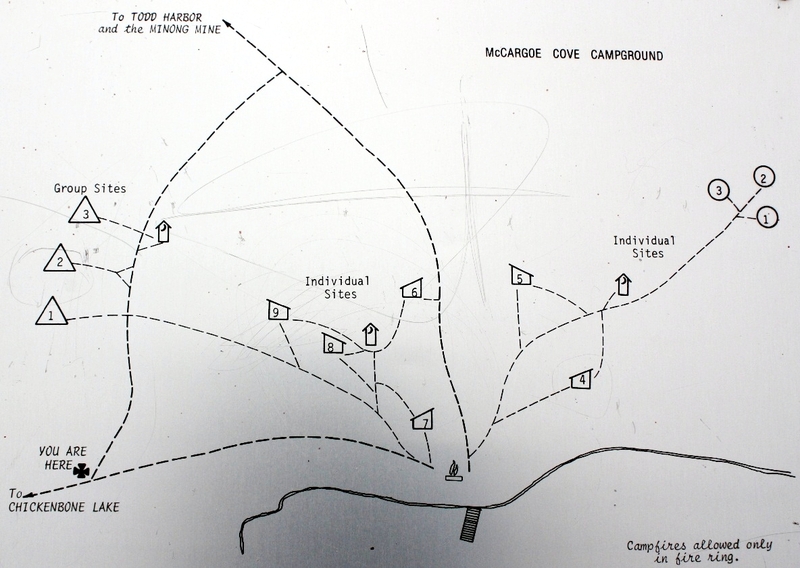 The Campground is 0.5 (Map) / 0.41 (GPS) miles south of the Minong Ridge trail. The trail descends a total of 80’ from the post on the trail. It is an easy walk in or out of the campground from the ridge, with only 1 hill just as you approach the lake. In the springtime, it can be hard to see the trail due to the leaves on the ground, and you need to keep an eye ahead of you to see the contrast of the trail. 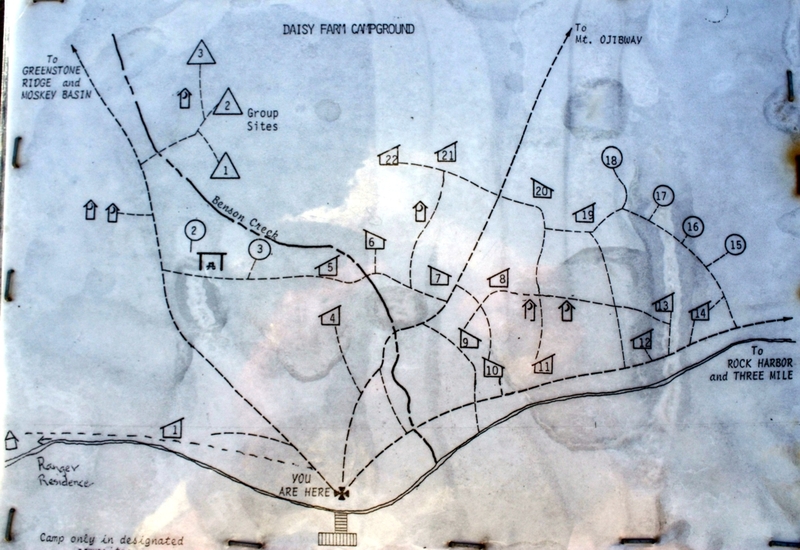 The Campground is 0.5 (Map) / 0.39 miles north from the Greenstone Ridge Trail. The trail descends 165’ to the campground. It leaves the post down a small valley in the ridge and turns westward and starts slowly downward along the edge of a hill, through a forest and some damp areas, until turning to the north and coming to some boards and stepping stones over a wet area, just before coming to the campground sign. 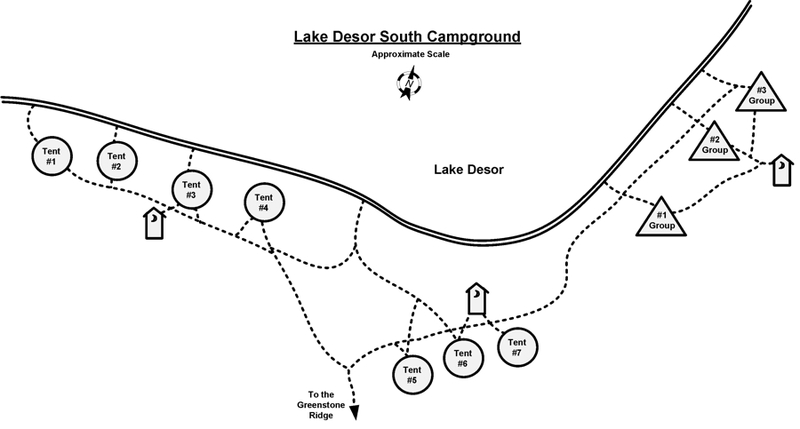 It is situated within 25’ to 75’ of the lake, depending on the campsite. 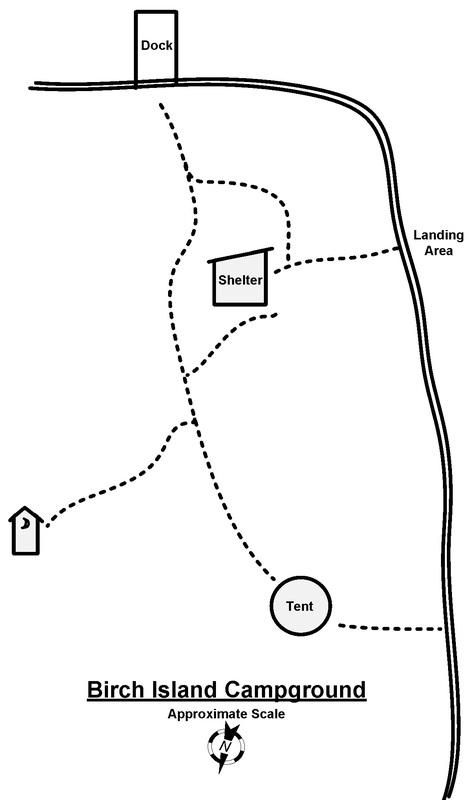 There are 4 tent sites to the left and 3 sites to the right. The group sites are to the right, 0.17 miles, across boards over some wetlands and a small creek. The Campground sits on the northeast shore of the lake. The lake is serene and peaceful. It is a good place to hear loons and moose, due to the quiet. It is a good sunrise viewing place in the fall, and sunset viewing in the spring. Around July and August, it is excellent for either. Water is available close to any of the campsites. From the east to west campground posts, it is 0.14 miles. The Campground is located on the northwest side of Lake Richie. It is very serene and similar to the other campground on Lake Richie, only there is no chance of anyone walking into camp, as they would have to paddle, swim or go cross-country. This can be a popular campground as it is a stop on the lake to lake route north / south across the island. The sites are pretty big though and separated so it can accommodate a lot of people comfortably. 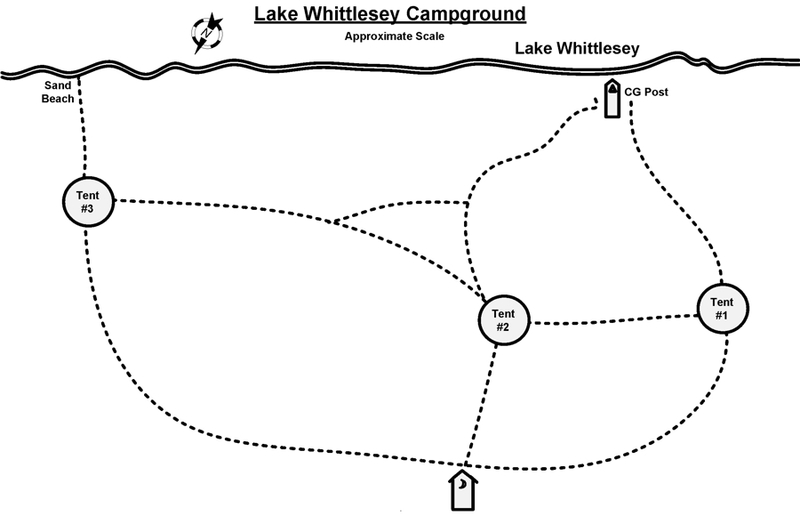 The Campground is very peaceful, located right on the north shore of Lake Whittlesey, a quiet lake with a strong wilderness feeling. There are a lot of birch trees and many rock outcroppings surrounding the campsites. It is similar to Hatchet Lake Campground, but very open. There is not a lot to do here unless you are fishing, but it is a very nice place to relax for the day. The Campground was relocated from an area further east about ten years ago. This is noticeable, as the campground seems newer and less used. It is very private and not used as much as most, because it is a “dead end” at the end of Lane Cove Trail. The area is quite wooded and along Lake Superior. 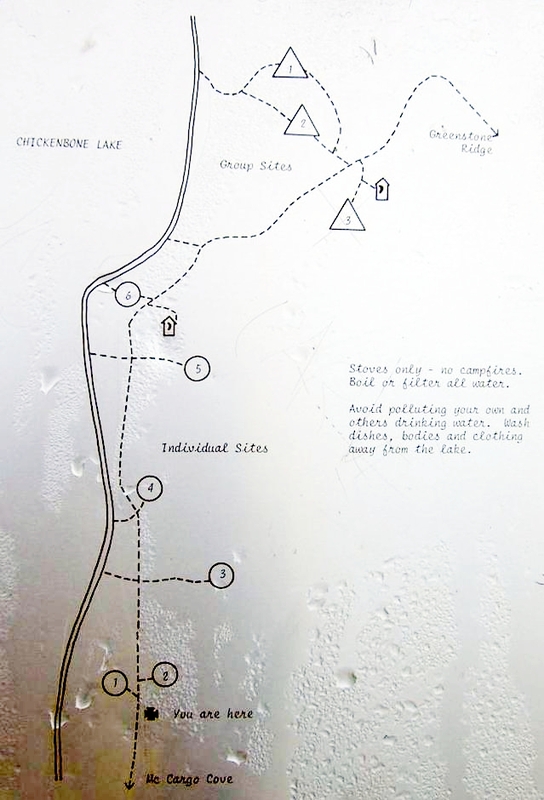 The trail descends a total of, around 550’, from the Greenstone Ridge Trail to the campground. The Campground does not seem to be used very often and is not maintained, so it has a nice rustic feel. It is a very nice place to spend a day relaxing, due to its wilderness feel and view of the lake. It is one of my favorites. The Campground is located right on a beautiful bay, overlooking Lake Superior. This is a large campground and very pretty. The views from all of the shelters are great. This is also a very popular campground with the boaters and fisherman, due to its location and the dock. Generators are allowed here at the dock, but the dock is about 0.2 miles from the west campground sign, and any activity at the dock is far enough away from the campground, to where it is not a problem. 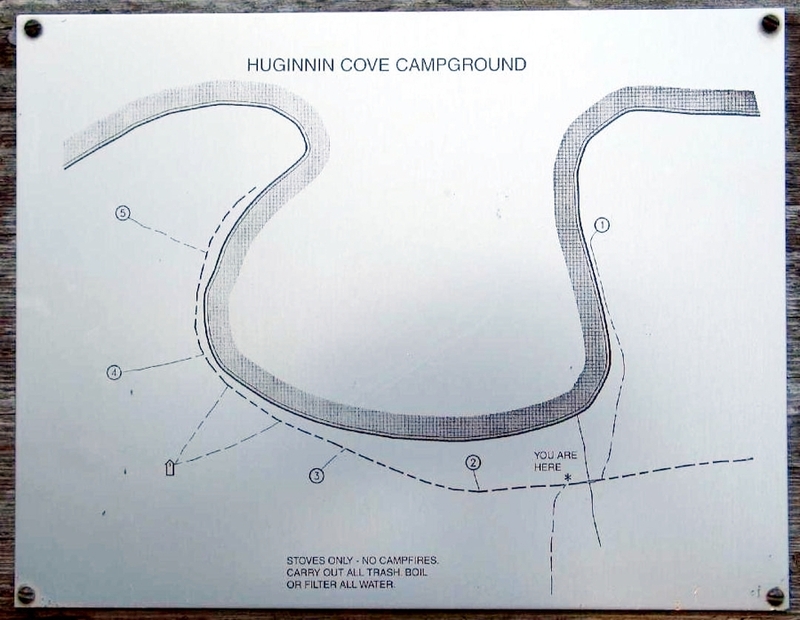 The Campground is located along a beautiful cove. It is truly one of those special Isle Royale views. There are usually people here because it is a drop off and pickup point, and is at the possible terminus of quite a few trails. But, even with people, it is a wilderness campground in feel. 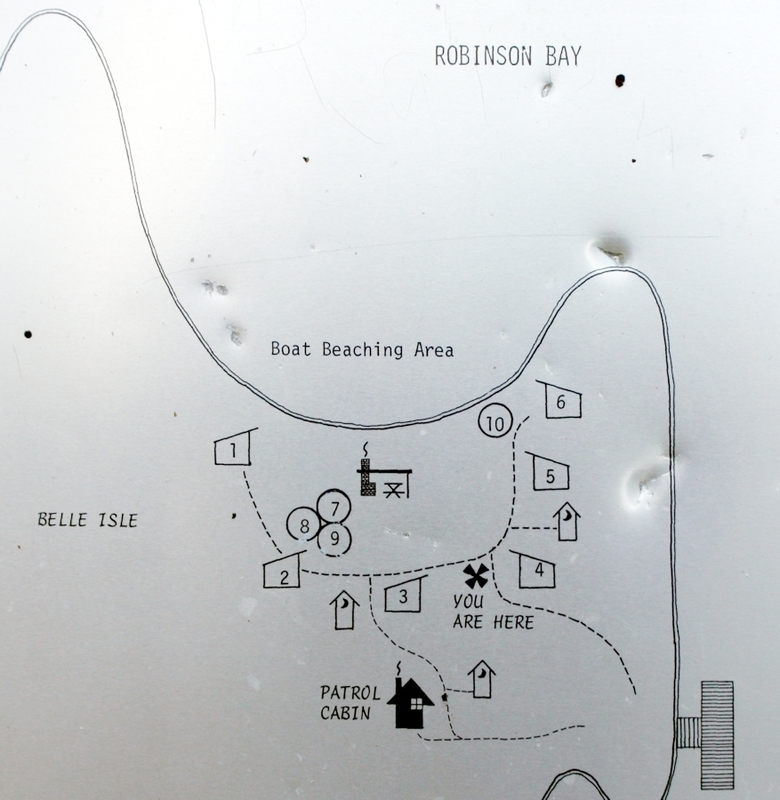 There is a campground map located along the shore, at the east entrance, to the group site and at the dock. There is also a post at the entrance coming off the Minong Ridge Trail. The post says the campground is 0.8 miles, GPS says 0.7 miles, to the campground map at the dock. The Campground is located just southwest of Blake Point. It sits on the southern shore about a half a mile from the point just across from Merritt Island. The campground itself is spectacular. The views are some of the best on the island in terms of campgrounds. From east looking out into Lake Superior, Passage Island and watching freighters go by, to looking south towards Merritt Island, Dog Island and the others, then looking west down Merritt Lane. The views are great anyway you look. I would stay in either site here. Even if someone is in the shelter, the tent site is very nice and somewhat private. Plus, on arriving here, there is very little choice besides going around the point, or going down Merritt Lane to a backcountry site. 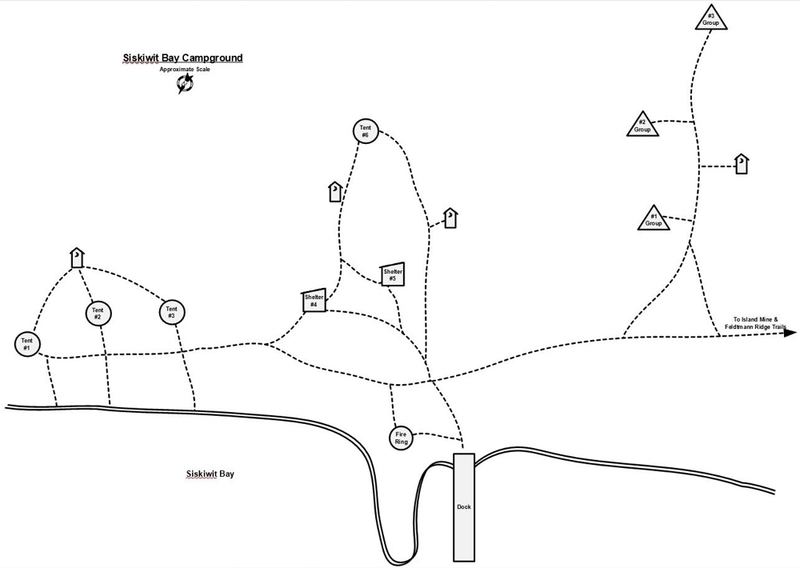 The Campground is 0.2 miles (Map), or 0.18 miles (GPS), from the post where Lake Richie and Rock Harbor trails meet. It is a beautiful campground with magnificent views of the shoreline, wonderful looking terrain, and an eastern view down the length of Rock Harbor. It has a dock. So there can be boaters, but it doesn’t seem as popular as most with docks. It is also a quiet and no generator zone, so if there are boaters, they will not be running a generator. 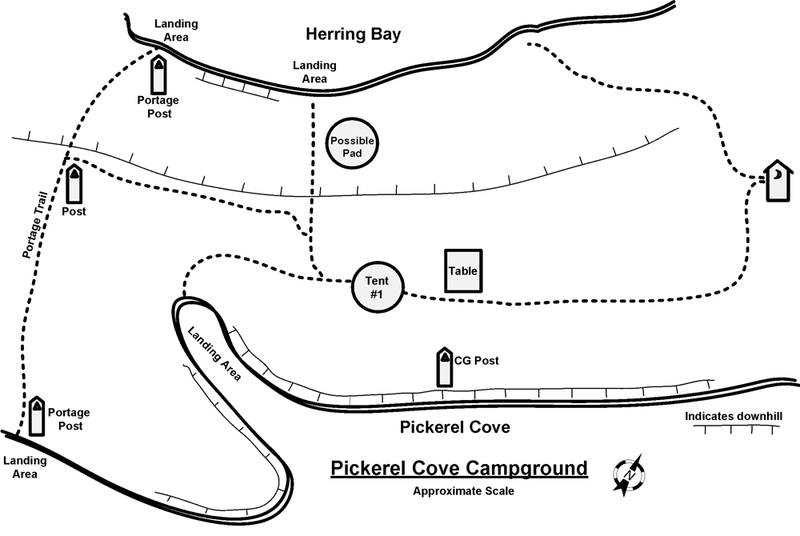 The Campground is very small and located on the north side of the island, near the portage from Herring Bay to Pickerel Cove. It sits on a narrow strip of land about 150’ across between the two facing south towards Pickerel Cove. It is the most isolated campground on the island and a great place to experience wilderness once you get there. Being that there is no dock, the only way to get to it is by canoe or kayak. 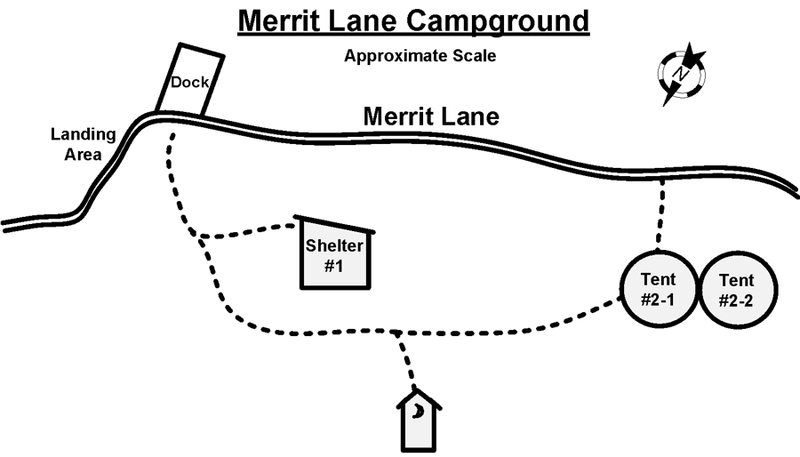 The Campground is just west of the dock, visitor station and store. If there is such a thing as a city on the island, this is it. Leaving the visitor center, there is a wide gravel trail (road). The trail passes ranger residences on the north at 0.03 miles, and another at 0.06 miles, before reaching the east campground sign at 0.18 miles. It passes by the shelters before reaching the center campground sign and trail that leads to the tent site, 400’ from, the east sign. The trail continues to the west campground sign, 200’ away, and the trail that leads to the group sites, and more tent sites. There are water spigots and outhouses located there. Treated drinking water is generally available from mid-April to mid-September. Stays are limited to one night, during the peak season. The Campground is 0.18 miles east of the post marking the junction of Feldtmann Ridge Trail and Island Mine Trail. The trail runs near the shore, with all of the sites on the south side of the trail. The farthest site is 0.23 miles east, from the trail post. All of the sites offer a good view of the bay. They range from 50’ to 100’ from the bay itself. There is a dock with a breakwater next to it, and a community fire ring near the dock, with two picnic tables next to it, if someone has not moved them. The bay is made up of the pinkish conglomerate beach, similar to Rainbow Cove, with more pink to it. If you go here, it’s pinkish soil will end up on your clothes and boots :-). One of the jewels of the island. Because the campground is not easy to walk to, it usually offers a good wilderness experience, but it is very popular with boaters. The Campground is located along the shore of the harbor. It is a lovely campground. Being that it is so close to Rock Harbor, it can be busy during peak season and will usually have people in it. The sites are quite nice and can offer privacy, even when busy. During the daytime, there is a constant parade of boats going past it from Mott to Rock Harbor, which takes away from the serenity. At night, there is a constant red light seen blinking at the Mott Island dock. There are two docks at the campground itself. It is 0.15 miles from the east campground sign to the west sign, and 0.09 miles from the east sign to the middle sign. 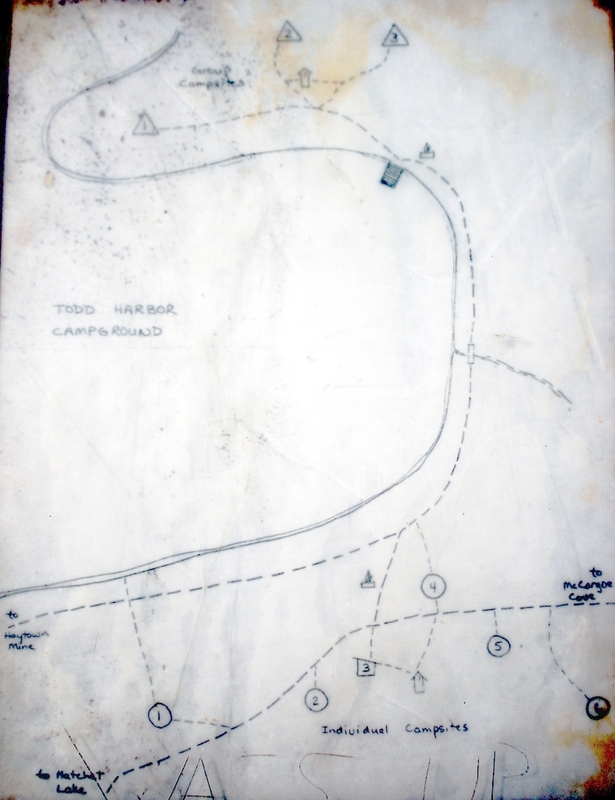 There is a rock outcropping separating the sections that must be climbed over, between shelter #10 and #8 and 9 tent sites, and there is a section of board that starts just east of the trail to the group sites, and ends just before tent #6. The Campground is located right on the trail and stretches for 0.1 miles end to end (not counting the group sites). It is located on a lovely harbor on the north shore of the island. There is one community fire ring near the individual sites, in front of the shelter, and one near the group sites by the dock. 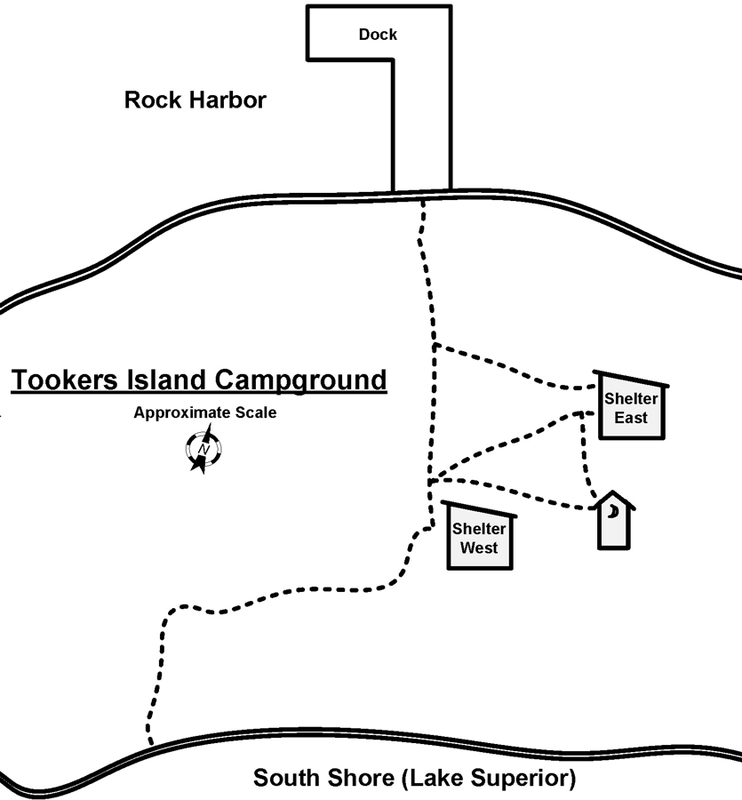 The Campground is located on Tookers Island, a small island west and south of the Rock Harbor Ranger Station dock. There is not a lot to do here, unless you paddle to nearby islands, but it is a wonderful place to spend the night or, relax for the day. The meadow is peaceful and beautiful and it is good for bird watching or just staring. The dock on the north side has great views up and down Rock Harbor and offers the potential for a great sunset. Down a very short trail, the south side rock beach is serene with views of Lake Superior and Heron Island. There are no “official” tent sites here, but there are places in the meadow near the shelters where tents could be put up. The dock is in a quiet zone and generators are not allowed to be used. There is no campground sign and I have just named the shelters east and west. The Campground is located right along the shore of Washington Creek, at the eastern end of Washington Harbor. If there were cities on the island, this would be the second largest. It is, 0.3 miles (GPS), from the post where the Greenstone trail ends, and 0.3 miles, from Windigo. It has drinking water spigots available from about mid-April until the end of September, in the campground along the beginning of the western and middle main trails (the middle spigot has been gone in recent years and still was as of Fall, 2011), and toilet paper supplied is available in all of the outhouses, which are close to any site in the campground. It is also a short walk from most of the sites to Washington Harbor, which is very beautiful, and has some great sunsets. For being as big as it is, it is a great place to stay. Especially when compared to Rock Harbor. 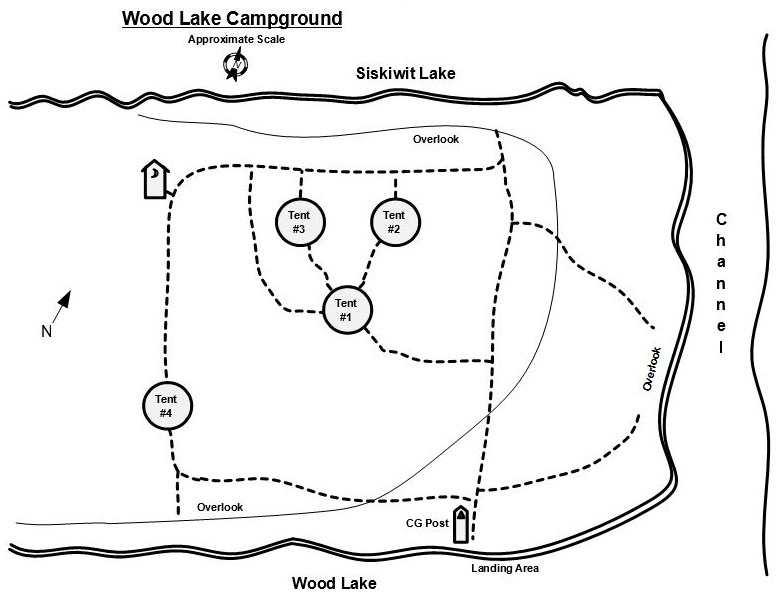 The Campground is on a peninsula, dividing Wood Lake from Siskiwit Lake. This is a very beautiful, peaceful and serene campground. There is a bluff on both sides of the peninsula. One overlooks Wood Lake, the other Siskiwit Lake.